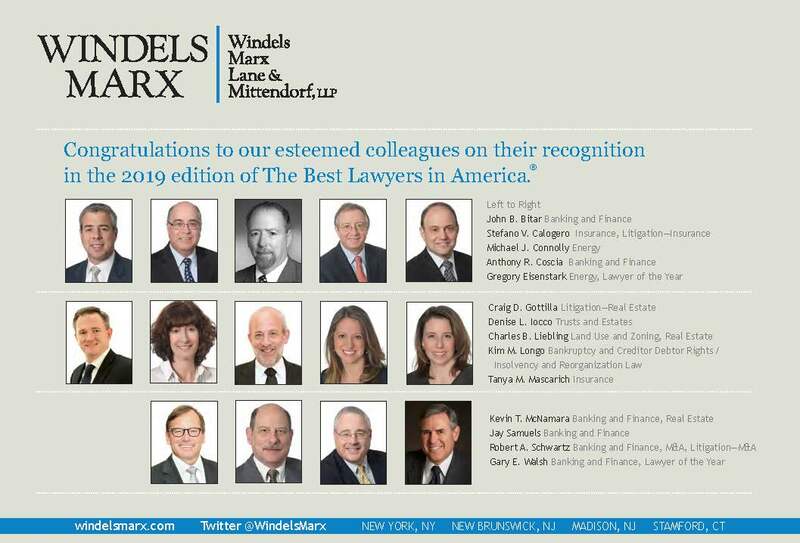 Ranking - The Best Lawyers in America 2019 Recognizes 14 Lawyers, 2 Named "Lawyer of the Year"
On August 15, 2018, The Best Lawyers in America announced the nominees to the 2019 edition. Windels Marx is pleased to share that three lawyers -- Denise Iocco, Kim Longo and Jay Samuels -- joined our growing list of nominations, which are now at 14. In addition, 2 lawyers were given the distinction of "Lawyer of the Year" for their categories: Greg Eisenstark (Energy Law) and Gary Walsh (Banking and Finance Law).